Keywords: Indigenous, AIIS (American Indian and Indigenous Studies), Michigan State University, Treaty of Saginaw of 1819, Turtle Island, NAISO (North American Indigenous Student Organization), settler colonialism, knowledge sharing, anthropology, indigeneity, reciprocity. 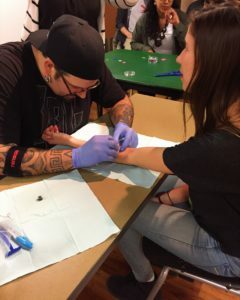 Above: Dion Kaszas shared his practice of skin stitch tatooing during performance hosted by the AIIS Program at Michigan State University in 2017. In the background, those watching sorts beads during his performance. Dion Kaszas, a Nlaka’pamux artist working to revitalize Indigenous tattooing practices was visiting Michigan State University’s campus in the spring semester of 2017. Dylan Miner, Director of American Indian & Indigenous Studies (AIIS), welcomed us to the event by introducing himself in Anishinaabemowin, followed by the English translation. He honored the 1819 Treaty of Saginaw land that this “Pioneer Land Grant” institution sits on. His words remind us who has always been here on the territory that is now called the Greater Lansing Area. Miner began this talk addressing the group the same way I had heard him begin others. His introduction acknowledges the complex, interwoven histories of this land and the indigenous-settler relationships that continue here. His statement brings forth notions of land sovereignty, oral storytelling, and cultural continuity. These themes are central in the contemporary narratives of those involved with AIIS at Michigan State University, and develop a community that conceptualizes international indigenous perspectives. Contemporary realities of the American Indians in Nkwegon* deserve respectful recognition after Anthropology’s aggressive sieges of knowledge from minority groups, and the aim of my research is to do so. I learned from faculty, students, and community members who are involved in the AIIS Program at Michigan State University. This program reflects, analyzes, and supports the policies, interests, and aspirations of indigenous people (Champagne). 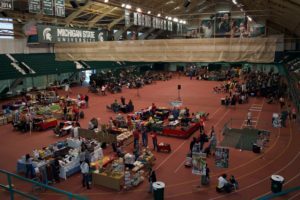 Figure 2: 34th Annual Powwow of Life hosted at Michigan State University and planned by NAISO. Near the front of the photo are vendors, and is the dance circle where the day’s main focus is. This was a community event that brought together food, music, and dancing. East Lansing: Collegeville Revisited, a history of the City of East Lansing, begins with this sentence. Little more was said about the trails mentioned. The regional history of Michigan Agricultural College founded in 1855, now known as Michigan State University, does not include the voices of the indigenous people who lived near Nkwegon. Although historic rhetoric may lead mainstream American consciousness to think otherwise, Indigenous culture is living and thriving. The discursive intersections of indigeneity and colonialism can be represented through the space of Michigan State University. This discourse articulates a common narrative surrounding settler colonialism on Turtle Island*. There is an erasure of American Indian identity in the history of the insitution. The more I read, the more I learned the “first” people who made history in East Lansing. The first white settler, the first canoer, the first president of the college, the first mayor (Terry). The institution pegs itself as being a “pioneer land grant” university, and nowhere did I find information regarding where the origin of the land grant came from. I didn’t learn about the communities of people who lived here before the city’s colonial structuring began. In 1900 as the institution’s student population boomed at MSU, “the local community included a diverse population of students, faculty, and farmers,” excluding the mention generations of American Indian communities (Whitney). There is no mention of the specific tribes that inhabited the land, instead institutional sources of knowledge form a Pan-Indian perspective and this develops social stigmas of “Indians.” There is an absence of the American Indian identity in the documented history of the university and it’s surroundings. For this reason, the AIIS program conceptualizes indigenous knowledge in institutional settings and creates agency in knowledge sharing for American Indians residing in Nkwegon. The use of space is central in Erin Sutherland’s profession as a private curator for indigenous performance artists. She creates space for performances that authentically represent the artist. Erin mentioned a gallery that once had an exhibit that, did not intend to but nonetheless, highlighted indigenous communities prior to contact and then communicated that they disappeared post contact. Western institutions that speak on behalf of minority groups have been known to disenfranchise in this way. Institutions that are centered on dominant culture knowledge tend to be the source of written history, and oral traditions are not documented (King). To Erin, curating opens a platform for discussion that builds community. Representation to mainstream thinkers of the indigenous worldview is important because of the limited vision of the dominant culture. It is imperative to speak of land sovereignty when understanding the indigenization of knowledge because it is an issue that has never changed (King). Since indigenous-settler relationships began, the issue has always been land. Settlers came for land, and the discourse of access to space is important for that reason. Land sovereignty means something different to each individual and therefore each tribal community. With that began said, land sovereignty is the right to self govern land; in the case of the institution, it is the right to self govern cultural, physical, and metaphysical space. Indigenous peoples have used storytelling as a form of agency since before documented written history. By speaking of land sovereignty and community, a platform for discussion of indigenous worldviews is created in a contemporary setting. Storytelling requires time to build relationships, and within these relationships is where knowledge is shared. Gordon Henry, an enrolled member of the White Earth Chippewa Tribe of Minnesota, helped to develop the proposal that became the American Indian Studies program in 2000. Alongside colleagues, he created the foundation of the community I am involved in today, now called the American Indian and Indigenous Studies program. He has continued to teach creative writing classes at MSU as well as Native literature (a course option for the AIIS undergraduate minor). He begins the first class of his courses with the creation story of the Lakota. “I always throw in Native pieces,” he explained. Gordon says he does so because it gives students a chance for imaginative thinking, as the creation story is one that many mainstream social thinkers have not heard. He also does so because “…we have forgotten how to listen.” By listening to the creation story, his students engage in a new idea through storytelling. It requires students to reconceptualize dominant notions of indigenous knowledge. Similarly, Erin points out that the semester-long timeline [of this research] is an example of a larger issue with research at universities: time. She explained this to me by referencing a poster taped to the front of her desk for an event titled “The Elders Say We Don’t Visit Anymore.” This poster provided an entry point to a discussion about spending time, listening, and interacting with community, of which the elders say we no longer do, Erin said. AIIS consistently makes visible the tensions inherent in the relationships between Indigenous peoples and the discipline of Anthropology. This tension is rooted in the violent history of Anthropology and its propensity to mine information from minority communities. “Arm-chair” anthropologists, from “chairs” at home, wrote of their understanding of minority cultures. Participant Observation research allowed space for biases, leaving decades of archives written from a Western perspective without bringing note to just that (Malinowski). Erin brought to light this issues as she taught the introductory course to AIIS Spring Semester of 2017 as well as during the interview. “I talk down Anthropology, but it is leading the way,” as a discipline she stated. It has critiqued itself in a way that allows for the human subjects of study to have greater agency in the research process. It is important to know the history of Anthropology to understand the contemporary positionality of the discipline. The continuation of storytelling in contemporary academia allows for the development of a conceptualized indigenous worldview. “It’s very powerful to exist in a space that has a history of exclusion of these knowledges,” Erin says. “It’s an example of survival.” By speaking of land sovereignty and community, the discussion of indigenous a platform for discussion of indigenous worldviews is created. Storytelling requires time to build relationships, and within these relationships is where knowledge is shared. Figure 3: Above, hear the voice of Erin Sutherland regarding the AIIS program. The interdisciplinary AIIS faculty allows for disciplines such as anthropology, psychology, and sociology, to speak the Native voice with their own lens. At MSU, Erin teaches the AIIS Introductory course, writes her dissertation, and becomes part of the community. She teaches class with a discussion-based mindset often talking about “space” created by colonialism. “The presence of the American Indian and Indigenous Studies program at MSU is powerful,” she stated. Her work in AIIS has provided Erin the opportunity to focus on Natives studies as well as broader social issues. Erin explains although there are advantages to an interdisciplinary approach to faculty such as that of AIIS, like not needing to answer to the Provost in the same ways, there are disadvantages as well because, as she describes, there is no glue for the faculty and they are answering to different departments. Erin explained that to check a box, despite good intentions, institutions will hire an indigenous person to fulfill a requirement, often times for a short amount of time or by placing them in positions that are demanding. As I worked to schedule interviews, I was met with this reality as the full schedules of faculty restricted their availability. The introductory course, offered first in Spring 2017, provides space for knowledges of values, cultures, histories, and governments to be conceptualized with a lens of indigeneity (Champagne). The institution plays a role in cultural continuity by providing a space for indigenous knowledge to be shared by indigenous people. As the Public Relations representative for NAISO, Karley Rivard, Little Traverse Bay Band of Odawa Indians, values the community she has found on campus. She is committed to creating a space for other American Indian students to feel comfortable learning about their culture, as well as providing logistical resources for them such as a place to print papers, refrigerate food, study, or socialize. She sees clearly the hidden fees of the institution, such as the cost of printing or parking, that can leave students who come from low-income families in difficult situations. MSU is where Karley began learning about her community’s history in a way that did not coincide with the dominant culture’s notion of indigenous knowledge. This course is one of her final credits needed to complete the minor. After taking the introductory AIIS course, she notes, “This class made me realize how angry I am. I’m angry about what others don’t know,” Karley explained, “and I’m angry about what I didn’t know… I know it’s something I can work through.” The erasure of the American Indian identity in her past education has led Karley to frustration, and the AIIS courses have brought the reality of her people to light for her. Karley is a senior Hospitality Business major with an AIIS minor. The knowledge shared with her through AIIS, as well as other academic focuses, allows for cultural continuity. She is dedicated to food sovereignty of indigenous peoples, and will go on to become a chef of indigenous cuisine. Her passion for this exemplifies thriving indigenous ways of life. In conclusion, the AIIS program has developed a community that conceptualizes international indigenous perspectives. The relations I have created with individuals in the program are examples of storytelling turning to community. Notions of land sovereignty, oral storytelling, and cultural continuity are central themes in the contemporary narratives of those involved with AIIS at Michigan State University. When the interview with Gordon concluded, I offered him a gift of tobacco. As I reached into my bag to get it, he said “You’re not doing what I think you’re doing.” I held the tobacco tie in my left hand then handed it to him. “You’re doing it right,” he told me. I thanked him for sharing his perspective with me, and for the relationship we have built through passing each other periodically at the local yoga studio, the halls of campus, and now in his office. He cupped the tobacco in his hand and told me he will hang it on the tree during ceremony this summer. I learned the teaching of gifting tobacco from Erin, I tied my first tobacco tie with Karley, and I offered that tie to Gordon. Having a space to learn practices through relationship building is key to the continuity of Anishinaabe culture. The most pressing problem my research has exposed to me is the lack of rhetoric surrounding the American Indians who lived, and still live, in the East Lansing area. For this reason, I focused heavily on compiling the words describing “the Indians” in the area when Michigan Agricultural College was begun. I did this through books at local book stores, books at the East Lansing library, and searching the MSU web archives. I also began participating in community conversations and events while conducting interviews with individuals that I had built relationships with. I argue that the program at Michigan State University is a mark of the Indigenous Rising social movement currently taking place in the United States and elsewhere. By the development of the introductory AIIS as well as community events for undergraduates, graduates, faculty and the East Lansing community, the program continues to establish a voice in the Greater Nkwegon Area and have claim sovereignty over the indigenous knowledge that is shared. Furthering this research would include a more extensive view at the stories of the elders in the East Lansing community including documentation of their narrative, whether essay or documentary style. I hope to continue exploring this topic. I will focus on the crossroads and power lines of colonialism and education in East Lansing, Michigan. Further, I would also like to work alongside Indigistory, an organization dedicated to documenting the stories of indigenous peoples of all ages. Gordon is the director of this organization. I have a responsibility as a researcher to consider who I am researching, their communities, and my own community. Through interviews, archival work, and mixed media, I navigated the themes of land sovereignty, oral story telling. I have found these themes in conversation while taking part in community events ran by and for the Indigenous communities in East Nkwegon. I have learned that in order to better the indigenous-settler relationship on the territory that holds Michigan State University, I must personally tend to it. Spending time to build relationships that lead to the sharing of knowledge, and reciprocating that knowledge is where my journey to allyship is beginning. *Turtle Island refers to the area of North America, but also encompasses beyond the nation-state borders of the continent. Figure 1: Photo by Erin Sutherland. March 28, 2017. Figure 2: Photo by Monica Williamson. April 15, 2017. Figure 3: Audio recording of Erin Sutherland. Personal interview. February 28, 2017. “American Indian and Indigenous Studies.” American Indian and Indigenous Studies: Native History at MSU. N.p., n.d. Web. <http://aisp.msu.edu/about/history/>. Champagne, Duane, and Meyers Bahr, Diana. UCLA American Indian Studies Center. Los Angeles: Oral History Program, U of California, Los Angeles, 2003. Print. Chapter 2. Dustin, Fred. The 1819 Saginaw Cession. Modified from a 1919 book: “The Saginaw Treaty of 1819”., n.d. Web. <http://geo.msu.edu/extra/geogmich/saginaw-cession.html>. Erickson, Paul A., and Murphy, Liam D. Readings for a History of Anthropological Theory. University of Toronto Press. Ontario, Canada. 2013. Print. King, Thomas. The Inconvenient Indian. Minneapolis, MN. University of Minnesota Press, 2013. Print. LeBeau, Patrick Russell. ““Realizing the Dreams” in Four Directions: The American Indian Studies at Michigan State University.” Indigenous Nations Studies 3.2 (2002): 89-98. Web. <https://kuscholarworks.ku.edu/bitstream/handle/1808/5788/ins.v03.n2.89-98.pdf?sequence=1>. Miller, Whitney. East Lansing: Collegeville revisited. Chicago: Arcadia, 2002. Print. Terry, Stephen. Michigan Agricultural College campus life 1900-1925: a postcard tour. Holt, MI: Thunder Bay Press, 2014. Print. Thank you to the AIIS program faculty, graduates, undergraduates, and community members for an inclusive learning environment, especially to those who shared their knowledge with me for this project. You have provided me a space for personal and academic growth. Last update: May 7, 2017 at 21:13.